February 11, 2015, 3:49 PM · The Walt Disney World Speedway will close in late June, according to a report from the Orlando Sentinel. The Speedway currently provides a home to Disney World's version of the Richard Petty Driving Experience, where visitors can drive or ride in professional racing stock cars and exotic sports cars, including Ferraris and Lamborghinis. The Richard Petty Driving Experience has been the primary tenant at the Speedway since 1997. But the Speedway opened a year earlier, when it hosted the first race in the split that nearly destroyed IndyCar-style open wheel racing. The 1996 Indy 200 at Walt Disney World was the first race of the Indy Racing League, a breakaway series from the Championship Auto Racing Teams [CART] series that ran all IndyCar racing in the world, outside of the Indianapolis 500 itself. The owners of Indianapolis Motor Speedway decided to form the IRL to take control of the sport, but only managed to cripple it, as sponsors and fans soon fled to NASCAR and Formula 1 during the years when no-name drivers filled the field at Indianapolis and other IRL events. For several years, the Tomorrowland Speedway at the Magic Kingdom was named the Tomorrowland Indy Speedway, with a small-scale replica of the scoring pylon from the Indianapolis Motor Speedway, as part of the resort's deal with the owners of the IMS. FWIW, Buzz Calkins won that first race in Orlando. No, no one remembers him. But the runner-up, a rookie named Tony Stewart, went on to do pretty well. The IRL ran four more races at the WDW Speedway, which fans nicknamed "The Mickyard," as a play on the Indianapolis Motor Speedway's nickname of "The Brickyard." CART eventually evolved into Champ Car, which merged back with the IRL in 2008 to form what is today's Verizon IndyCar Series. Its first race of the season will be in St. Petersburg next month. According to the Disney resort, the Speedway grounds will be used for "transportation improvements." Could a parking lot expansion be on the way? Petty Holdings, operator of Richard Petty Driving Experience and Exotic Driving Experience, confirmed that starting July 1, they will no longer operate their experiences out of the Walt Disney World Speedway. Walt Disney World has plans to use the land to make transportation improvements. February 11, 2015 at 5:14 PM · At first I was excited because I thought the Tomorrowland Speedway was closing. Now I'm just sad from that hype. February 11, 2015 at 5:21 PM · I was sad because I thought it was the Tomorrowland Speedway, but happy that it is not! KEEP FANTASYLAND OUT OF TOMORROWLAND! February 11, 2015 at 6:13 PM · "when no-name drivers filled the field at Indianapolis and other IRL events"
They were "no-name" only to casual or wannabe motorsports fans. Thos "no-name" driver were the ones who earned a chance to race at Indy because they had talent and not a fat wallet or sponsor. Those drivers were household names to real race fans who actually follow racing on more than one level. Three time NASCAR champion Tony Stewart was just one of them. If not for the IRL, Tony never would have gotten a shot at Indy or NASCAR. February 11, 2015 at 6:30 PM · Ditto on thinking it was the Tomorrowland Speedway. I ran the WDW Marathon last year and the course went around the racetrack before connecting back to one of the backstage roads toward Animal Kingdom. It was a cool experience. There were locals with their classic cars parked on the track cheering the runners on. The only missed opportunity for Disney was to have a photo-op with Lightning McQueen along the track. With the speedway going away, the changes coming to Disney Hollywood Studios park, and the construction of Avatar-land at AK, Rundisney's courses are definitely going to have some major course changes in the next couple of years. February 11, 2015 at 7:01 PM · Robert, great history on The Split. I gather you are an Indycar fan (and fell on the CART side of things)? Sadly not many of us left out there. I moved to Indy to study motorsports engineering and hopefully work for an Indycar team. Also worth mentioning, this speedway is also where Sam Schmidt had his testing accident that left him paralyzed. He has since gone on to be one of the most successful team owners in Indy Lights and quickly growing in success in VICS, and last year lapped IMS at 100 mph in a Corvette modified to be controlled by head movements. However, that remains another black mark upon WDW Speedway. Though with Indycar trying to start its season earlier, and the international series not panning out, having a non-ISC or otherwise NASCAR-affiliated oval in Florida might have been nice. Edit: just realized it was never upgraded with safer barriers. Upgrading the safety equipment and the infrastructure, not to mention he parking issues, wouldn't make it worth it. February 11, 2015 at 8:37 PM · To the poster who hoped Tomorrowland Speedway was closing, please look at it through the eyes of a six-year old. Driving a car! On a "real" racetrack! February 11, 2015 at 9:45 PM · Nice add Tyler. Thanks. Sam is an amazing individual. One wonders if the WDW Speedway could have continued if it were located down by the Wide World of Sports complex. But having to devote the MK parking lot to raceday spectators instead of MK visitors pretty much doomed the speedway, as there just aren't any weekends anymore when almost no one visits the MK. 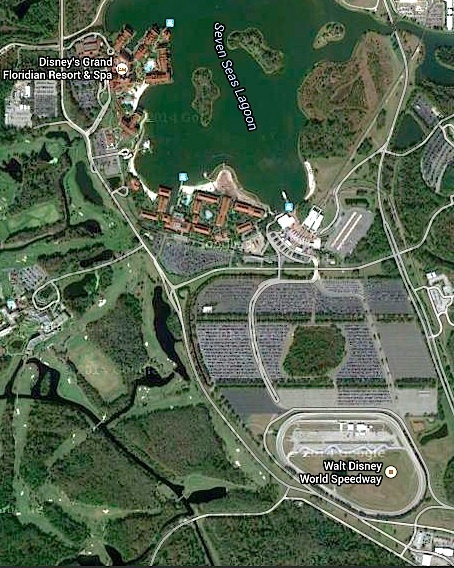 February 11, 2015 at 9:48 PM · One more thing: If you look at that map, you can see the opportunity to completely change the traffic flow into and out of the MK parking lot, which really could help some of the traffic back-ups and snarls that the park can get on busy days. February 11, 2015 at 11:47 PM · @ Anon Poster 75.69.25.44: Yes, I am not a six-year old and I have no doubt that the Speedway is enjoyed by many kids who take the (usually long) time to ride it. However, the standard cars-on-a-track ride is a staple you can find at pretty much any local amusement park, so it's certainly not needed at Disney. There is plenty for a six-year old to do at the Magic Kingdom and still have fun, even if they don't get to drive a car. Further, the Speedway only has a 4 rating on the site (by comparison, Dumbo, another kiddie ride, has a 7). However, if taking a kid on their "first drive" is a necessary rite of passage, you can go to Old Town and ride their go karts for a far cheaper and probably more fun experience. Sorry to hear of the track's closing. As a motorsports journalist, I covered every Indy 200 at The Walt Disney World Speedway, except the first (which I still have on tape). The track was built at a time when Disney Sports was looking to shape WDW as a sporting destination. By forming an alliance with the Indy Racing League (now IndyCar), Disney Sports could assist WDW resorts by helping sell hotel rooms during the traditional value season slump in late January. Most of the drivers in the IRL at the time (1996-2000) were former CART drivers, and they enjoyed the WDW oval (which has bricks from the Indianapolis Motor Speedway, aka "the Brickyard", embedded in the track, as the IMS was founder/promoter of the Indy 200). Tony Stewart told me many times he thought the WDW oval was one of the toughest to drive: Turn 1 has a slight elevation drop to the apex, requiring a heavy load of downforce at the end of the main straight, leading to a tricky double-apex at Turn 2, then a short shot to a straightforward Turn 3. Some drivers, like Formula 1 veteran and Indy 500 champion Eddie Cheever, were big fans of the track, saying it drove like a road course. I finally got a chance to drive the track myself in an Indy Racing Experience Indy car nine years after the last Indy car race there, and loved it. Also got to lap it, at speed, in the two-seater Indy car with IndyCar veteran and team owner Davey Hamilton. What an outstanding track. I loved working that race. Stayed at the Poly and walked to the track every morning. The leisurely walks back to the Poly (and drinks at O'hana) in the evenings are cherished memories. The track will be missed by a lot of IndyCar fans. Regarding the history of the sport as you report it, well, writing as someone who covered the IRL, also covered CART, I'll agree that the IRL/CART split was hard on the sport. But it can easily be argued it was necessary. CART failed in 2003, and CART's successor, the ChampCar World Series (CCWS), failed three years later - both victims of shoddy business models. The CCWS assets were acquired by the Indy Racing League in 2007 (often mistakenly termed a "merger" - CCWS teams had nowhere else to go). Had the IRL/IndyCar not been created, the flawed business models of the road racing-oriented CART/CCWS would predictably have ended open-wheel racing in North America for good by 2005. Having seen the financials, this is a sad truth. For CART fans, the Walt Disney World oval was the Fort Sumter of the Indy car civil war. For IRL fans, it was the home of many treasured race and vacation memories, and will be remembered with great fondness. February 12, 2015 at 2:25 AM · Ah, I too was hoping this article was about the Tomorrowland Speedway, and thought it was, until reading a few lines. Alas, I would love to see them reroute traffic at the very least. My little dream scenario would be that they'd build a second Ticket & Transportation Center for a monorail that would go to DHS. I figure by the time that is built, along with the new monorail tracks, they might finally start building Star Wars Land. Ha! My dreams of a monorail extension or addition will never come to pass, I'm guessing. February 12, 2015 at 5:51 AM · Dang it I thought this was about Tomorrow Land Speedway closing. That thing is horrible. February 12, 2015 at 8:03 AM · Tomorrowland speed way needs to go! The only thing fun about it is getting a buzz of all the gas fumes. I can only imagine what the employees are breathing all day long. That is prime realestate for a new high tech ride. Like James said above you kind find this type of experience at any Six FLags type park. February 12, 2015 at 9:16 AM · From a "retro" perspective of these two subjects. I still carry my Disneyland Tomorrowland drivers license PROUDLY. :) I also did the Richard Petty driving experience as a gift from my family about 5 years ago, super cool! Financially, the WD World Speedway probably reflects NASCAR today as profits are down or maybe they are losing money. Sadly it will probably go away as new ideas (profit) are tested. Maybe they should convert the Speedway over to a "Frozen" themed ride, I'm sure every 10 year girl would want to do a ** "ride along" in a 140 mph sleigh! **Heavy on the sarcasm font!! February 12, 2015 at 9:22 AM · Great, this summer I was going to give it a try for my 60th. I guess I'll have to do the Tomorrowland Speedway. February 12, 2015 at 10:29 AM · Sorry to see it go...I experienced my first hot laps at the Speedway with the Richard Petty Driving Experience...great experience! Your comments on CART read like a tried and true oval/dirt track racing fan. However, they have no basis in reality. CART was a booming business in 1995 and was even beginning to threaten F1. Then Tony George took his ball (the squared oval) and went home. CART remained strong for a couple of years but eventually sponsors started to leave because they were not getting the Indy exposure. Even in the last year of ChampCar, the attendance at races and TV ratings for ChampCar were significantly better than those for the IRL, the Indy 500 excepted. Had Tony George not wanted to take total control, and allowed CART to control Indycar racing, I contend it would be bigger than F1 at the moment. The cars run in CART were more powerful and better looking then the current crop of F1 machinery. Unfortunately, due to the Hulman family's war chest and their willingness to let the IRL continue to drain it, the wrong side won the war. World wide, racing fans know that open wheel cars don't belong on ovals. The Indy 500 was always the only exception to that rule (from a world wide perspective). The only time ever that an oval race counted toward the F1 world championship was when the Indy 500 was included. American style sprint car racing is a completely different animal. It isn't and never really was a way to develop top level (CART/F1) open wheel talent. There hasn't been a genuine open wheel star the came out of American sprint car racing since the A.J. Foyt, Mario Andretti era. Significantly, there hasn't been one since the split that was supposed to produce one either. So, the split did not need to happen and was the primary driver in destroying open wheel racing in America. The new league has not delivered improvements on even one of the "problems" it was proposed to "fix". February 12, 2015 at 2:54 PM · This article wasn't even about the Tomorrowland Speedway, yet somehow that is what most people are discussing. Frankly, I don't see a problem with the Tomorrowland Speedway. February 16, 2015 at 12:42 PM · I was there in January of 1997 for the NASCAR Craftsman Truck race working on one of trucks number 12. It was cold there that weekend. Anybody else remember that race?